Here are the best tourist sites in the former feudal city of Hue, which is most famous for the Hue Royal Citadel. This lagoon system which spans over 70km and covers more than 22,000 hectares is the largest in all of Southeast Asia. The brackish coastal lagoon is fed by four different rivers (O Lau, Bo, Huong and Truoi rivers) and is one of the most important sources of fish in the area. Approximately half a million people make their livelihood from the lagoon. It is only 15 km from Hue city centre. The lagoon boasts abundant and diversified nature, with 921 aquatic species including some rare species of fish and plants. It also supplies food and shelter for 73 different species of migrating birds. The majority of the residents living near the lagoon are involved in fishing activities to earn their livings. Lang Co Bay is located at the bottom of Hai Van Pass, which lies between Danang and Hue cities on the central coast. Lang Co is part of a larger natural set up which includes mountains, a river, a lagoon, an island and a beach 32 km in length. A long white-sand beach with blue seawater of Lang Co may capture every visitor’s heart at first sight. Visiting Lang Co Bay at sunset, you may feel nostalgic when seeing a peaceful fishing village with boat sailing in Lap An Lagoon (near Lang Co bay), together with flocks of storks flying back to their nest. Being part of the Gulf of Lang Co, Lap An lagoon is an 800 hectare brackish water lagoon, which is famous for its poetic beauty of mountains, clouds and sky reflecting in the clean blue water surface as well as for rich natural resources including mangroves. Lap An is an ideal place for photographers and explorers. The best time to visit the lagoon is at dusk. The natural complex of Lang Co Bay, Lap An and Cau Hai lagoons are regarded as one of the most beautiful destinations in Southeast Asia. It is home to 11,000 local people who earn their living by catching and farming fish, as well as providing tourism services. In addition, visitors to Lang Co Bay area for its cool climate of around 25 degrees Celsius, especially in summer when heat waves normally hit the central region. Particularly, what really makes Lang Co bay special is its close proximity to four Vietnam’s World Heritage Sites, including the ancient citadel of Hue, Hoi An ancient town, My Son Sanctuary and Phong Nha Ke Bang National Park. All of which are within a radius of 150 kilometers. Also, Lang Co is near Hai Van Pass with spectacular scenery and the harmonious beauty of the clouds, mountains and sea and the national park of Bach Ma. Last but not least, visitors to Lang Co have acchance to taste fresh seafood from the lagoons of brackish water and saltwater. Lang Co was acknowledged as one among 30 most beautiful bays in the world by the Club of the World’s Best Bays (Worldbays) in 2009. This is the 3rd Vietnam owns the bay which is listed on the club’s list after Halong Bay and Nha Trang Bay. From Hue City on National Highway 1A for about 30km and then onto a shade covered village road, Truoi Lake lies amidst magnificent mountains starting from the Bach Ma Range. The lake, located in Loc Hoa Commune, Phu Loc District, Thua Thien-Hue Province, is a frequent destination for tourists this summer. The lake is a hydroelectric work built in 1996 and makes a strong impression with its crystal water and poetic surroundings. The lake has a 50m embankment and a capacity of 60 million cubic meters of water. Upon reaching the wharf which is about 100m from the embankment, tourists hire a 15-20 seat boat to start the excursion and ask the boatman to be the tour guide. These tours are from 8 a.m. to 5 p.m.
As the surroundings wind along Bach Ma Mountain, tourists can admire splendid sceneries. After 30 minutes on the boat, tourists may become hypnotized by the fascinating wilderness with the murmur of streams ahead and the hundreds of rocks emerging from them. Here, tourists can take a bath, sit on the rocks and fish or stroll around to discover nature. Daily worries and stresses will surely drift away with the flowing water. Visitors should bring food for the picnic and then catch fish and have lunch together. After a meal, tourists can explore the forest at the foot of Thanh Long Mountain to enjoy the wildlife. This forest is home to many species of seasoned trees and wild animals. 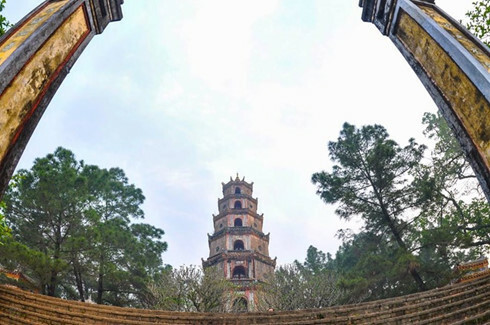 On the way back to the wharf, tourists should not miss Truc Lam Bach Ma Pagoda nestled at the foot of Linh Son Mountain to contemplate its elegant architecture as well as to find tranquility for the soul. Tourists must first conquer 172 stone steps to reach the pagoda but the panoramic view of Truoi Lake is worth the sweat. The pagoda was built in 2006 on an area of 1.9ha on top of a lovely hill. Located in Mai Gia Phuong village, Loc Binh commune, Phu Loc district, Thua Thien Hue province, Ganh Lang is a tourism community that is developed by the local authorities. What Ganh Lang has is: fresh air, scenery, various and unique ecosystem. Besides, Ganh Lang has a famous cooking Melaleuca village. Suoi Mo (Mo Stream) is an interesting tourist destination in the town of Lang Co, in Phu Loc district, about 65km from the city of Hue. Suoi Mo welcomes visitors with cool primary forests. This is an ideal place to hide from the heat in the central in the summer. Thanh Toan village in Thuy Thanh commune, Huong Thuy district, Thua Thien-Hue province is one of the most beautiful villages in Hue. The village, 8km east of Hue, is famous for its beautiful roads, peaceful rural landscape and particularly the tile-roofed bridge, which has become a popular destination for tourists. The 17m long and 4m wide wooden bridge in the village surprises most visitors when they arrive. It is an arch bridge with both sides being protected by railings with balconies. The bridge crosses an irrigation canal extending from the entrance to the end of the village. On each side are benches inviting you to take a rest. 18 wooden pillars and iron-work support the bridge. The bridge is unique because of its tiled-roof- a rarity that makes it a model among the bridges built at that time in Vietnam. Next to the bridge is the village market which is small but offers everything, especially culinary specialties like Hen rice, fish-pancakes, and a wide variety of rice noodles. On the other side of the bridge is a showroom displaying agricultural tools: plows, harrows, sickles, scoops, and rice mills. There are also bamboo and rattan souvenirs. The Huong (Perfume) River is a river that crosses the capital city of Hue. It is around 80 kilometers long, and owes its name to the fact that it flows through many forests of aromatic plants before reaching Hue, bringing with it a pure and fresh aroma. The poetic romantic Perfume River is deep inspiration to numerous artists, poets, and composers. In the autumn, flowers from orchards upriver from Hue fall into the water, giving the river a perfume-like aroma, and a beautiful poetic view. Today, travelers coming to Hue should not miss boating along the river. Most of them admit that this is one of the most beautiful and extremely splendid riverside landscape (especially at night when lights are on) that they have ever visited. Tthe river flows through a series of beauty-spots, taking visitors to every corner of the ancient citadel when you travel by boat. Along the river, you can visit Da Vien, Phu Xuan, and Truong Tien Bridges, come to the Tomb of Minh Mang, Hon Chen Shrine, Thien Mu Pagoda, and finally to bathe in the sea. Upstream, at the Tomb of Thien Tho, you can hear the rustling of the pine trees. When the night comes, the surface of the river glistens under the moonlight, and the songs of the boat rowers can be heard breaking the silence. As one of the most popular attractions in this romantic city, a boat ride or cruise on the Huong River in Hue is included in a lot of classic Hue city tours or day trips. Over 100 years have passed, the graceful bridge still reflects on the Huong (Perfume) River to witness all the ups and downs of history and countless ‘scars of time’ and becomes a romantic symbol of the ancient capital. In 1897, the French Resident Superior in Central Vietnam – Levecque – assigned Eiffel of France (known for the Eiffel Tower in Paris) to design and build the Truong Tien Bridge. The construction completed in 1899. To date, the bridge has connected the banks of the Perfume River for 114 years and it is even older than the historic bridge of Long Bien in Hanoi (1899-1902). Truong Tien Bridge has many names: Thanh Thai (name of the Thanh Thai King of the Nguyen Dynasty), Clemenceau (a French Prime Minister during the First World War), Nguyen Hoang (The Nguyen lord who explored the central region between the 16th and early 17th century) and Truong Tien or Trang Tien because the bridge was located near a coin casting enterprise of the Nguyen Dynasty. For more than 100 years of history, the graceful Truong Tien Bridge has undergone many changes and ups and downs along with the ancient capital. In 1904, the historic storm damaged the bridge. In 1906, the bridge was repaired, and the bridge surface was changed from wood to reinforced concrete. In 1937, during the reign of Emperor Bao Dai, the bridge was extended for bicycles and pedestrians. In 1946, part of the bridge collapsed due to mines in the Vietnam – France War. In 1953, it was repaired. In 1968, Truong Tien Bridge again collapsed into the Huong River. Until 1991, Truong Tien Bridge was renovated again, lasted for 5 years (1991-1995). In 2002, a modern lighting system was installed on the bridge. The bridge has become part of the history of Hue City. Although there are many other bridges across the Perfume River, such as Bach Ho, Phu Xuan or Bai Dau, Truong Tien is still the most typical and a symbol of the romantic city of Hue. The name of the pagoda comes from a legend: long ago, an old woman appeared on the hill where the pagoda stands today. She told local people that a Lord would come and build a Buddhist pagoda for the country’s prosperity. Lord Nguyen Hoang, on hearing that, ordered the construction of the pagoda of the “Heavenly Lady”. The pagoda is situated on Ha Khe hill, on the left bank of the Huong (Perfume) River, in Huong Long village, 5km from Hue city. It was built in 1601, and then Lord Nguyen Phuc Tan had it renovated in 1665. In 1710, Lord Nguyen Phuc Chu had a great bell cast (2.5m high, 3.285kg) and in 1715, he had a stele (2.58 m high) erected on the back of a marble tortoise. Several kings of the Nguyen Dynasty such as Gia Long, Minh Mang, Thieu Tri and Thanh Thai, all had the pagoda restored. Phuoc Duyen tower (at first called Tu Nhan tower) was erected in 1884 by King Thieu Tri. This octagonal tower has seven storeys (2m high). Dai Hung shrine, the main-hall, presents a magnificent architecture. As well as bronze cast statues, it shelters some precious antiques: the bronze gong cast in 1677, the wooden gilded board with Lord Nguyen Phuc Chu’s inscriptions (1714). On both sides of the pagoda are a room for bonzes and a guest-room for visitors. The pagoda is surrounded by flowers and ornamental plants. At the far end of the garden stretches a calm and romantic pine-tree forest. The pagoda was heavily damaged in 1943. Bonze Thich Don Hau hence organised a great renovation of the pagoda that lasted for more than 30 years. Nowadays the pagoda is very well-maintained and very welcoming to all visitors.